It has the makings of a Dickens novel. The best of times. The worst of times. A city of lights. A city of blight. This tale of two cities, however, unfolds in the desert where Utah meets Nevada and sleepy Wendover,meets bustling West Wendover. Most people these days just call the whole thing Wendover. 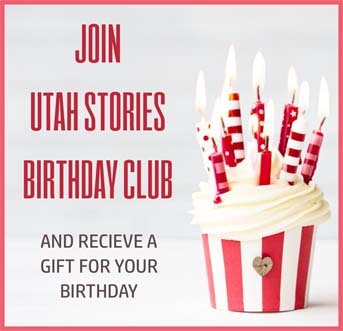 But you aren’t going to gamble, eat cheap prime rib or get a free plush hotel room on the Utah side, and you won’t find many weathered buildings on the Nevada side. Wendover sprung out of the desert as a water stop for the Western Pacific Railroad in 1908, but it would take more than 60 years for it to become a town. During World War II, the government opened the Wendover Army Air Field, the top-secret training grounds for the Enola Gay crew as it prepared to drop the atomic bomb on Hiroshima. At its peak, the base employed nearly 20,000 people, but after the war ended, the base was deactivated and in 1969 closed altogether. In 1977 the government handed the airstrip and a collection of empty barracks to the town of Wendover, founded only seven years earlier. The story of Nevada’s Wendover began when William Smith opened a simple gas station in 1926. When Nevada legalized gambling five years later, Smith’s gas station expanded, straddling the border to become the State Line Casino and Hotel. A painted line down the middle of the building marked where the two states came together. 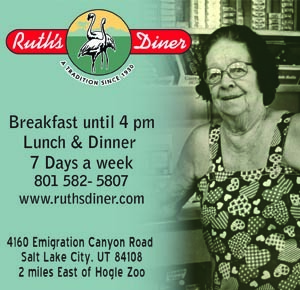 Guests could dine in Utah and feed slot machines in Nevada. 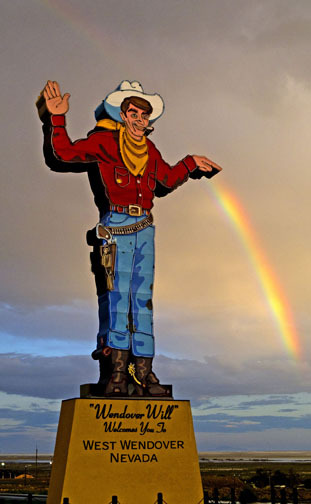 Over the decades, other casinos moved into West Wendover, but it is the State Line Casino that has Wendover Will, a 63-foot-tall neon figure built in the 1950s sporting a cowboy hat, boots and blue jeans. From his perch over the state line, Wendover Will beckons to travelers and is a Wendover icon. The Nevada side mostly benefited from those travelers, though. By the time West Wendover was officially founded in July 1991, its neighbor in Utah was in shambles. Today, the towns share schools, police and fire departments, but any talk of uniting the two Wendovers has ended. Blaine Tilbury downplays the difference between the towns. “It’s all the same,” says Tilbury, who has lived most of his 64 years in the area on both sides of the Wendover divide. Born on the Utah side to a woman who worked on the base, Tilbury got his first job as a busboy at the State Line. Today, he lives on the Nevada side, but he says he doesn’t care for what’s happened on that side of the border. “I don’t like it as big as it is,” he says.